It’s a pain locking a bike when popping into a shop for a few minutes – especially when you know you’ll be fumbling for your keys minutes later. But the key is set to become a thing of the past now that designers have created a Bluetooth padlock that can be unlocked simply by hovering a smartphone nearby. According to dailymail , The padlock, which resembles a traditional one, is the first to allow users to open a lock without keys using an iOS or Android app. To work the ‘Noke’ lock, a user must press the shackle when they and their phone are nearby. ‘Noke wakes up and searches for your phone or a shared phone. If the phone is within a few feet, Noke will instantly unlock so you can be on your way. No need to launch an app or remove your phone from your pocket or purse,’ the company wrote on Kickstarter. It uses signals sent via Bluetooth to a smartphone to identify the owner of the lock and in this way will also allow people to share their lock – so two people could access one bike, for example, either temporarily or permanently. Utah-based design company Fuz Designs created the smart padlock to solve the problems associated with traditional padlocks and keys, which are easy to lose, can be stolen and are hard to share. 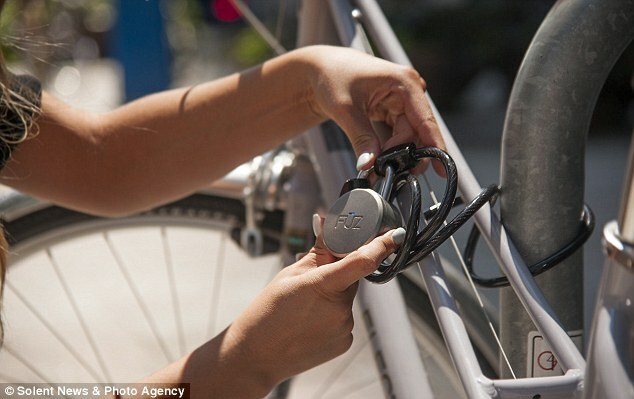 The device weighs just over eight ounces (227 grams) and is designed to be used with a cable for bikes, as well as securing sheds. It is made from hardened steel and boron and has a long-life battery that promises to last for a year with continuous use. If a user’s phone, or the lock’s battery dies, they will be able to use ‘quick click’ technology to access the lock, allowing them to key in a sequence of pre-determined clicks manually using the shackle. Co-founder of the company, Cameron Gibbs, 35, said: ‘Noke is roughly the same size as a traditional padlock. The Noke padlock connects via Bluetooth with an iOS or Android app to automatically identify the owner of the lock. To unlock Noke, users simply have to press the shackle. It wakes up and searches for a phone and if it senses the handset is within a few feet, it instantly unlocks so users don’t even have to take their phone out of their pocket. The app allows instant and secure sharing so users can choose to let another person temporarily or permanently access their bike – or whatever the padlock is protecting. It can also be opened if a user learns a sequence of clicks – so it works a little like a combination lock without numbers. ‘It is 3.3 inches (9cm) tall and 2.2 inches (6cm) wide and weighs about eight ounces. The firm is currently raising funding on Kickstarter and has smashed its $100,000 (£62,000) target, pulling in over $500,000 (£310,106). The lock is available to pre-order for $59 (£37) with a shipping date in February, but will retail for around $89 (£55). IS THE NOKE PADLOCK SECURE? Noke’s creators claim their smart lock is secure. It can only be unlocked when a user’s smartphone is hovered within feet of the device. A user can turn off the auto-unlock feature so it will not be accidentally unlocked if they are nearby. It uses Bluetooth 4.0, which contains the highest level of security, according to the firm. Bluetooth 4.0 uses a 128-bit AES CCM encryption algorithm and the designers have added their own PKI technology and cryptographic key exchange protocol to prevent the device being hacked. The main threats come in the way of ‘traditional theft’ as a thief could steal a smartphone and use it to unlock a bike, for example. The lock is also designed to be shared, meaning people must choose their friends wisely or risk their valuables being stolen, despite the smart padlock.